In a blind study, both men and women rated the body odor of vegetarians as more attractive than that of meat eaters. On top of bothersome hot flashes and night sweats, changes in body odor that occur as a result of these menopause symptoms are one of the most odious side effects of menopause. Changes in body odor can lead to embarrassment, dejection, and anxiety in social situations. Fortunately, once the root cause of these changes in body odor is understood, it is possible to control them and regain confidence. Keep reading to learn more about changes in body odor, why they occur during menopause, and how to treat them. Body odor is a byproduct of sweating, the body's natural cooling system. 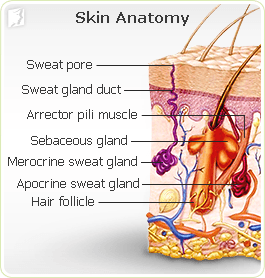 The body has two types of sweat glands. Numerous typical menopause symptoms can increase sweat production, which can lead to changes in body odor. Hot flashes and night sweats in particular have a strong effect, though psychological symptoms such as panic attacks and anxiety can lead to an increase in the incidence of sweating as well. More sweat makes changes in body odor more noticeable. Keep reading to learn more about the causes of the increased sweat production that results in changes in body odor. Menopause can be a difficult transition to go through for many reasons, and it can be made more difficult by unexpected body odor. Click the following link to learn more about the four main different types of body odor and what each of them means. Though many find it an uncomfortable subject to discuss, female body odor is actually a common problem, and it becomes increasingly likely as women mature and experience menopause.No one has to live with body odor issues forever - especially when just a few simple alterations to daily food choices could eliminate the problem. 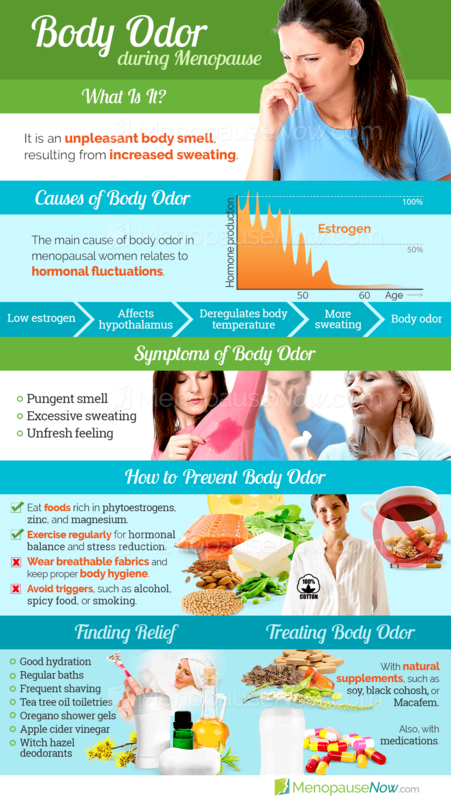 For most middle-aged women, hormone fluctuations are the primary cause of body odor changes. The main player is estrogen, which is responsible for helping regulate the hypothalamus, the part of the brain that controls body temperature. When estrogen levels drop, as is common during menopause, a false message is sent to the hypothalamus saying that the body is overheated. The body then springs into action, which results in an increase in sweat production and changes in body odor. In addition, other factors may play a role in the changes in body odor a woman experiences; diet, stress, certain diseases, and genetics are all potential causes. Synthetic fabrics such as polyester or other non-breathable materials will also collect sweat and may lead to increased body odor. Changes in body odor don't have to be permanent for women. Read on to learn about treatment options to regain one's former natural level of body odor. Body odor issues come with a stigma attached which means they can be extremely difficult to discuss in public. Unfortunately, the end result of this is the issue never becoming resolved. 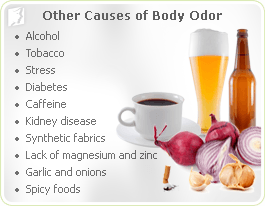 To learn more about body odor and its various causes check out the following article. 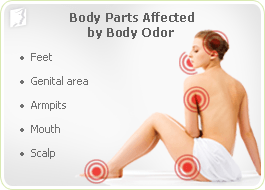 There are many treatment options available for women to fight unwelcome changes in body odor. Zinc and magnesium help banish body odor. Seafood, particularly oysters, and nuts are high in both nutrients. It is generally recommended that women begin with the least invasive option, which would be lifestyle changes. If changes in body odor are being caused by stress or poor nutrition, eating a balanced diet rich in magnesium and zinc in particular can be extremely beneficial. Practicing stress reduction techniques such as yoga or meditation can also help, as can wearing breathable cotton clothing and bathing regularly. Lifestyle changes can be difficult to implement all at once for a busy woman, however. Because body odor is primarily due to hormone fluctuations, the most effect approach is to treat the problem directly at the source. A variety of natural and alternative remedies exist that are able to address this hormonal imbalance. A combination of lifestyle changes and alternative medicine is often the most effective way to manage body odor. If women are experiencing other symptoms that may be indicative of a more serious issue, they should consult a trusted medical professional. Pharmaceutical options are also available for treating changes in body odor, but are recommended only under very severe circumstances due to the potential side effects. Click on the following link to learn specific treatments for changes in body odor, which begin with lifestyle changes, move onto alternative medicines, and finally, if those options do not work, prescription medications. The most effective treatments typically combine lifestyle changes and alternative medicine. While these antiperspirants are considered safe for general use, it is important to remember that they do contain significant amounts of chemical. For this reason you should adhere to the instructions provided with regards to where they can be used on the body, what ages they are suitable for, and whether they require washing off. Bad body odor is an embarrassing condition among women going through the menopausal transition. Luckily, there are numerous natural ways to combat this unpleasant problem and prevent it from inhibiting your daily functioning. 12/03/2018 Body odor is the result of excessive sweating. For women about to end their reproductive years, menopause is generally the culprit behind the bad sweat smell. Continue reading to learn more about what causes sweat to smell as well as how it's related to the menopausal transition. 08/17/2011 Many women voice concerns about increases and changes in body odor and sweating when they enter the menopausal transition. Keep reading to find out five things you should know about menopausal body odor to finally stop feeling self-conscious about your personal space. 08/17/2011 There is a right and a wrong way when it comes to talking to your wife about her changes in body odor. Click here for tips on how you should approach the subject if your wife has changes in body odor without increasing tension between the two of you.